ADA compliant deep draft pool lift, extended reach feature is for partially raised pool walls and wide curbs, 350 lbs capacity. Highlights of the Ambassador include a 350 pound weight capacity, higher seat for easier wheelchair transfers and an increased setback of up to 38 inches. 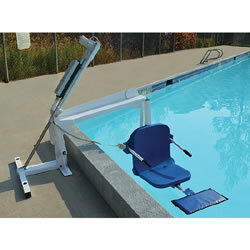 This extended reach pool lift comes as a standard deep draft and is also available in a reverse configuration. The Ambassador Pool Lift is independently verified to meet ADA compliance standards.